I am now finishing up my research projects in Australia, and since I have collected so much video while I’ve been working on my projects, I made a short video to explain some of what I have been doing at Macquarie University in Sydney, Australia. My goal is to use oysters that have grown up in areas acidified by acid sulphate soils (a natural process that occurs in some parts of Australia) to understand how ocean acidification may impact an oyster’s ability to protect itself from crabs. Ocean acidification is expected to dissolve shell material, in much the same way chalk dissolves in vinegar, or teeth dissolve in soda. However it will be a slow process of acidification, so animals such as oysters may have time to get used to the extra acid in the system. In Australia, the oysters that grow up in areas with acid sulphate soils have had generations to adapt or acclimate to changes, so this is a great place to start. Will oysters that grew up in acidic conditions be eaten faster by predatory mud crabs? Or have they figured out some way to compensate? How might oysters respond to gradual changes in acidity, as is expected to happen world wide with climate change and ocean acidification? Hopefully after I analyze all of my data, I will have some answers. Drawing from original draw-a-scientist study in 1983. Photo By Yewhoenter via Wikimedia Commons. At the beginning of my graduate school career I remember sitting in on a seminar about a recent program implemented by several students called “draw a scientist”. Students involved in a GK-12 program, where graduate students bring science to middle school and high school classrooms, were asked to draw their version of a scientist. In the drawings, crazy hair, flasks, and lab coats were a common element. Students described their scientists using adjectives like smart, crazy, chemicals, mixing, nerd, weird, lab coat, old, lab work, hard-working, and cool. At that age, I probably would have drawn the same thing, except my scientist would have been female, and I would have most definitely included the word “cool” in my description. However, my experience as a scientist has not led me to don a lab coat very often. I have held a few jobs that included pristine labs with white, crisp coats and flasks, but more often than not, I am wearing muddy waders, hiking boots, or dive suits. Fishing for crabs on the York River. 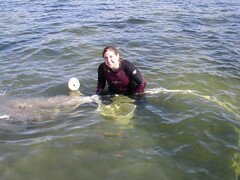 I am a marine scientist, and I study the interactions between animals that live in the ocean. Right now I am studying predator-prey interactions in the Chesapeake Bay, which is not exactly the ocean but it is pretty salty. It is an estuary, where the rivers from the land meet the ocean and a mix of fresh and salt water occurs. The Chesapeake Bay is home to many species found in the Atlantic, as well as some that are only found in estuaries. I am focusing my research on two predators, the blue crab and the cownose ray, and a few of their prey species, including the soft-shell clam (steamers in New England), hard clams (or quahogs), razor clams (often used as bait), mussels, and Eastern oysters. My research is attempting to answer the question, how will these predator-prey interactions change in the future as climate change impacts the Chesapeake Bay in various ways? Scientists never really prove anything; they can only provide supporting evidence for a phenomenon, and as the amount of evidence grows, so does the scientist’s confidence that their answer is correct. Thus my research project that I am completing for my PhD will collect a variety of evidence to answer my research question. I have to look at the problem in a number of different ways, using not only experiments in the laboratory, but also observations and experiments from the Chesapeake Bay itself, and predictions from mathematical models. That is why getting an advanced degree in science takes so long and involves so much work. Scientists-in-training are learning how to build a body of evidence to try and answer a research question. When completed, my dissertation will consist of four different chapters which summarize eight (or more) research projects, all designed to provide some evidence pointing towards the answer of my research question. In the end I still won’t have an answer; just a starting point and a hundred more questions. Remember, science is a journey. Suction sampling using a large pump to collect clams. So what do I actually do? In the summer I go out on some rivers that feed into the Chesapeake Bay, like the York River, in a small boat and collect samples in shallow water. Most of my samples are suction samples. To take these samples I use a large pump that works as an underwater vacuum, allowing me to vacuum up the mud and sand on the bottom of the river. I use these samples to understand how many clams are in an area. I also tow nets behind the boat to collect fish and crabs (the predators in the area), and snorkel along a 50 m rope laid out on the bottom of the shallow parts of the river to count the pits that rays make when they feed. This is a much easier way to figure out how many rays are in an area than actually catching the rays. 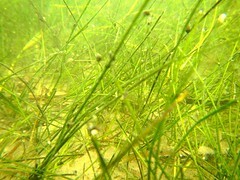 Photo from a clear-water day in the Chesapeake Bay. The water is mostly muddy but every so often, when the conditions are right, I feel like I am snorkeling in the tropics. Those are the best days, when I get to see vast expanses of seagrass, the terrapins (a type of swimming turtle that gets about the size of a dinner plate) swim next to me, and I can see all of the little clams and worms on the river bottom going about their business, excavating burrows and spewing out streams of mud that look like something that comes out of a Play-Doh pasta factory. But most days I can only see about a foot in front of my face, and the view is frequently obstructed by translucent jellyfish tentacles that appear too late for any sort of evasive maneuver, and the resultant burning pain is just treated as part of the overall experience. Hey, it could be worse. We could be in our office. For the rest of the year I devote my time to a number of activities. These include sorting through the suction samples to pick out the clams, holding an active leadership role in graduate student government, keeping up to date on the latest science discoveries in my field, fulfilling my current funding requirements (this year, I was a guest scientist in a 7th grade classroom for a couple of days every week), writing grant proposals to fund my education next year, writing reports (and soon my own scientific articles to be published in a journal), and working on a project in the seawater laboratory (see video). I visit the seawater laboratory every day of the week, devotedly, except for Sunday. All of my critters (blue crabs, clams, mussels, and oysters) seem to behave on Sunday. However, if I fail to visit any other day of the week, disaster abounds. I return to rampant cannibalism (in the blue crab tank, of course), escapees, clogged plumbing, leaky ceilings, broken water heaters, overflowing tanks, you name it. For a while I was convinced that the brand-new seawater laboratory was haunted. Now I know that this is just one of the things that makes ecology so interesting and exciting. Since I am always working with live critters, things never really go as planned. I have spent most of my time in graduate school anticipating the evil intentions of invertebrates, some of which don’t even have brains. As a result I have had many chances to exercise creative, out-of-the-box thinking, and when I fail, the consequences are usually pretty hilarious. 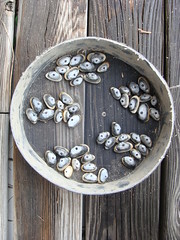 I mark clams with marker before placing them in the river, so if I get them back I know they are from my experiment. For instance, last summer I was running an experiment in several tanks where crabs were offered clams for food. There were various scenarios that made it harder to get at the food (i.e. clams were hidden underneath a layer of shell), and crabs are lazy, so it shouldn’t surprise me that the crab starring in this story had had enough, and was ready to strike out on his own to find a more promising food source. Despite precautions to prevent this type of thing from happening, the crab climbed out of the tank and into an adjacent tank. This rarely happens; the tanks are round and only overlap for a small portion, but in this case the crab was on a mission and the result certainly paid off. The day before I spent 8 hours with a volunteer painstakingly marking clams and placing them in containers to be deployed in the York River the next week. The crab had discovered a buffet of epic proportions, and the next day I arrived in the lab to find shell splinters and an extremely well-fed blue crab. 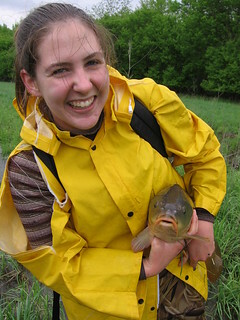 Catching a carp for fun while on the job. My experiences may not be typical of the average scientist, but I would argue that white lab coats are not typical of the average scientist, either. Scientists are just as likely to be “outdoorsy” as they are likely to be holding chemicals over a Bunsen burner. Programs like GK-12, sponsored by the National Science Foundation, help to inspire the next generation of scientists and to change the way people think of scientists. As a result these programs produce a more diversified next generation of scientists, and hopefully increase public trust in science programs. This is especially important because public trust in scientists is very low. This should be very concerning for scientists, a group of people who base their lives and careers on a quest for truth.